Researchers are developing an “augmented reality telementoring” system that could provide effective support to surgeons on the battlefield from specialists thousands of miles away. Telementoring allows a surgeon performing an operation to receive remote guidance from an expert using telecommunications. However, current systems require the surgeon to shift focus to a nearby apparatus called a “telestrator,” diverting attention from the operating table, said Juan Wachs, an associate professor of industrial engineering at Purdue. “Telementoring is widely used, but it’s still primitive in that it has not kept pace with advances in information technology and computer graphics,” says Juan Wachs, associate professor of industrial engineering at Purdue University. The new System for Telementoring with Augmented Reality (STAR) uses various technologies such as transparent displays and sensors to improve the quality of the communication between mentor and surgeon. “It is a step toward overcoming current limitations in telementoring by using so-called augmented reality to enhance the sense of ‘co-presence,’” Wachs says. The system integrates the mentor annotations and illustrations directly into the field of view of the surgeon using a transparent display, eliminating the need to shift focus away from the operation. The transparent display is placed in between the surgeon and the operating field. “The surgeon sees the operating field, the instruments, and their hands as if the display were not there, yet the operating field is enhanced with the mentor’s graphical annotations,” says Voicu S. Popescu, associate professor of computer science. For the study, published online in the journal the Visual Computer, researchers tested the system in a simulated “Role 2” military medical facility context, which consists of a forward surgical team with limited resources. “STAR may be useful in providing instructional simulations to support doctors serving in Iraq and Afghanistan in traumatic care on the battlefield,” says Brian Mullis, associate professor of orthopedic surgery at the IU School of Medicine. Mullis is a commander in the US Navy who has served in combat in Afghanistan. Augmented reality refers to enhancing the visual perception of the real world with instructive annotations, such as a line showing the surgeon where to make an incision, virtual instruments, and icons for hand gestures that instruct the surgeon to carry out specific actions. The transparent display is implemented with a tablet positioned between the surgeon and the operating field and held in place either with a robotic arm or a mechanical holder controlled by a surgical assistant. 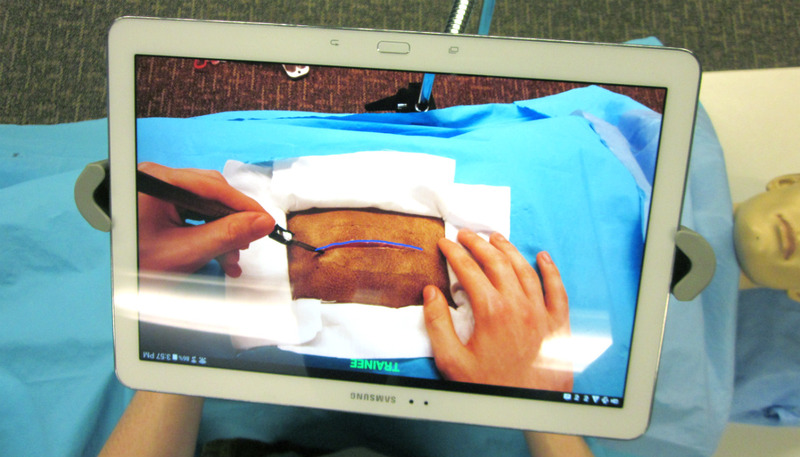 The tablet acquires a video stream of the operating field as the surgery proceeds. The video stream is sent to the mentor who enhances it with annotations, which are sent back to the surgery site and where they appear on the transparent display. Researchers are testing the system while performing procedures commonly carried out in operating rooms: cricothyrotomy, in which a tube is inserted into the throat to establish an airway; laparotomy, in which an incision is made in the abdomen to examine internal organs and structures in the abdomen; and fasciotomy, a limb-saving procedure that involves cutting the fascia, a layer of fibrous connective tissue surrounding muscles, to relieve pressure. The system uses computer vision algorithms in attempts to keep the annotations aligned with the quickly changing images of the surgery. “If I take a picture now, two seconds from now the camera has changed position and the patient has changed position, so the system has to keep the annotations in the proper place by aligning specific points that exist in every image,” Wachs says. Ongoing research focuses on improving the robustness of annotation anchoring with surgical field changes, the anchoring frame rate and the transparent display simulation fidelity. One complication is that because the surgeon’s hands are between the camera and the surgical field, they sometimes momentarily obstruct the mentor’s view. An algorithm could detect the obstruction and render the surgeon’s hands semi-transparently. Another limitation is that the mentor’s view of the surgical field is slightly different from the view from the tablet’s camera. The researchers are working to create images that mimic the realism of looking through a window. “The video acquired by the tablet will be warped to the view of the surgeon, which will require acquiring the operating field with a depth camera, similar to the Kinect camera, and will require tracking the surgeon’s head,” Popescu says. The system requires only off-the-shelf equipment such as consumer electronics. “We are using tablets that exist, robots that exist, we even did some experiments using Google Glass,” Wachs says. Such a system might one day be combined with sophisticated surgical robots, allowing specialists to actually perform procedures remotely. The Office of the Assistant Secretary of Defense for Health Affairs funded the work. Opinions, interpretations, conclusions, and recommendations are those of the author and are not necessarily endorsed by the Department of Defense.